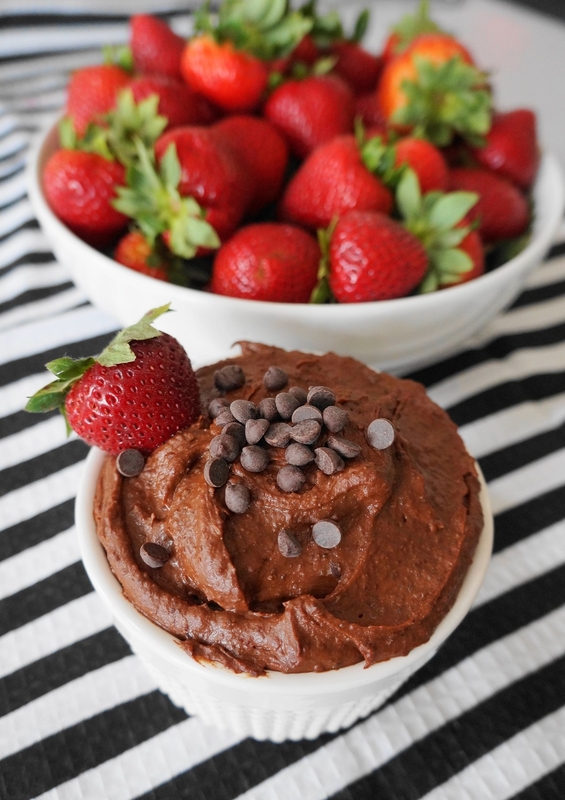 This could also be called “Brownie Batter Hummus”- why? It’s made with just four ingredients- one of them being black beans! One of my co-workers mentioned that she had heard of one of our local grocery stores carrying “Brownie Batter Hummus” and suggested I try to make a more natural version. I didn’t even need to come up with a new recipe, because a quick search led me to this recipe and it sounded perfect to me. Meaning it was fast, easy, and contained minimal ingredients. It’s made with black beans, cacao (or cocoa) powder, coconut sugar, and cashew butter (plus a little water to thin it out to your desired consistency). I love this dip with strawberries, but I’m sure it would also be great with apples or graham crackers. I didn’t have cashew butter, so I just processed some raw cashews until they were smooth and creamy before adding the other ingredients. If you make your own cashew butter like I did, just be aware that it does take a while and the cashews become dry and crumbly before coming together. Stick it out- it will get there! Next time I make this I will definitely be doubling the recipe because I can already tell it’s not going to last long in my house! NOTE: Interested in more healthy dips? Try this Cookie Dough Dip, too! What is the serving size for this? I may just be blind lol. You’re not blind-it’s not clear! The whole recipe makes about 10 servings. I don’t have the exact number for the size of each serving, but my estimate would be about 3 tablespoons per serving.